The first month of 2014 had been a weird one for me. My internal calendar had been all wrong. I think that week where I was so bed-ridden sick had thrown me completely off. I really didn't mind though, as January didn't feel like it had flown by like the previous months had. Which is nice. Feeling like I've got time (which really, I don't) had made me catch up on my knitting - like, I was actually waiting for the next clue at the end of each week in the Follow Your Arrow Mystery Shawl KAL rather than feverishly trying to knit the clues from 3 weeks ago; I've finished a pair of socks; I've cast on a new pair of socks; and I'm also leisurely knitting away (and yeah, kind of trying to finish before the weekend is over) on one of my not-so-secret secret projects. Fact: I'm a HUGE chocoholic. Seriously. HUGE. Always have been, always will be. You can even ask the Mister about this. He'll tell you that there's usually chocolate somewhere in the house and that I can rarely turn down anything that contains chocolate. I never crave savoury treats, I don't care much for salty, and while I have quite the sweet tooth I don't really favour candy. Unless it's caramel or salt water taffy. But those aren't really regular craving items, more like special treats that happen once in a while when the mood hits. But chocolate? Oohhh...I'm like Üter Zörker from the Simpsons ("don't make me run, I'm full of chocolate!"). Or better yet, like Goldilocks in the Mo Willems version of Goldilocks and the Three Dinosaurs - seriously, look that book up. So.freakin'.hilarious! When the Mister read it to the Munchkin and came to the part where Goldilocks finds the bowls of chocolate pudding, he exclaimed that I must have been the inspiration for that part! Anyhoo, I'm totally digressing. One of my favourite ways to eat chocolate (aside from shoving as much as possible into my mouth) is to have it with a nice cuppa tea. Lately that tea has been either a peppermint/spearmint tea or a full flavoured, straight up black tea. I didn't know if it was the right way or not, but my favourite way to pair the two is to put a piece of chocolate in my mouth and take a sip of tea. Another favourite way: make a cuppa of peppermint tea, steep it for 3 minutes, take out the bag/leaves, and then add hot chocolate mix. Soooo yummy! This has been my beverage of choice pretty much every night this winter! 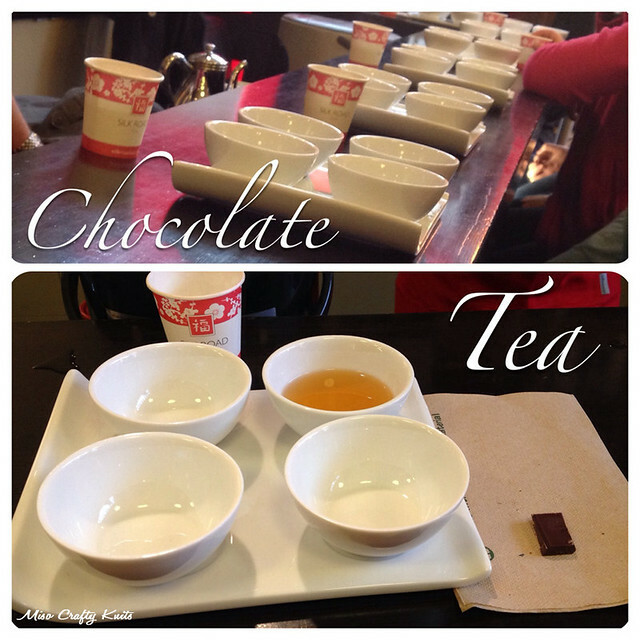 Earlier in the month my friend Cate had signed a bunch of us up for a tea and chocolate pairing workshop at a local tea shop. It was such a fun half hour and I got to try out some new-to-me yummy teas. If there's such an opportunity to do a workshop like this in your area, I highly recommend it!! So long pins! Hellooooo Wonder Clips! I have no idea where I've been all this time or why it's only now that I've discovered the sheer awesomeness of Wonder Clips by Clover, but man, am I ever glad I gave these bad boys a try!! I don't know how I've been sewing without them! No more piercing precious or fine fabrics with stubby (and sometimes nicked) pins. No more scraping the table with awkward metal binder clips (usually in various sizes, which makes it even more awkward). No more distorting thick layers of fabric by trying to pin it all together. Wonder Clips have arrived to make my sewing life a little bit easier. And why reserve these for just sewing? I think they'd be a fantastic asset to knitters who knit their garments in pieces. I don't know about you, but the very few times I've tried to mattress stitch my knitted seams together, those locking stitch markers just don't hold the pieces properly enough for my liking. It's all floppy and uneven, and before you know it you've either got a pucker in your seam or you've end up with an extra inch of the front bodice side seam and no more back seam. Although that could just be me on that last one. Me and hand-sewing apparently do not mix. 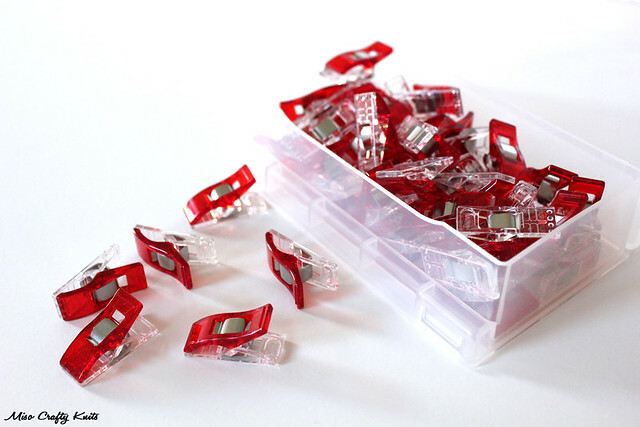 But now that I've got a box of Wonder Clips, I'm contemplating trying my hand at knitting up a garment in pieces again. During the last week of January I impatiently waited for the day when I could sign up for my very first Create-Your-Own Self-Striping Club by Yarntini. I have kept an eye on previous rounds of the club (and constantly kicked myself for not participating in one sooner) and now with my renewed love of sock knitting, I knew I just had to join the next round. It didn't matter that I vowed to go cold sheep until March (seriously, let's not talk about that). 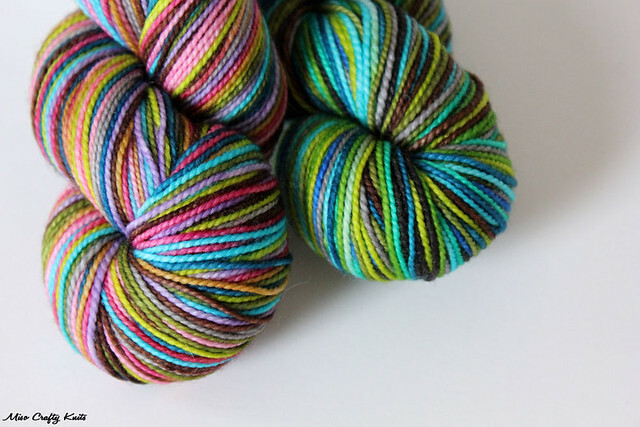 This is self-striping yarn we're talking about here!! To keep myself somewhat distracted until sign up day, I perused the Yarntini Ravelry group for colourway ideas and made little collages of striping colours based off of the solids that Jessie has posted on her website gallery (and that she currently has in her etsy shop). I think I've narrowed down my choices to a mere 9 colourways. Sadly, I'm only getting 3 skeins here so obviously I'm going to have to narrow down my selection even more. But until I have to email Jessie my final picks, I'm having loads of fun playing around with online colour wheels and stripe generators, and coming up with delicious colourways. I seriously want ALL the colours! I'm determined to have Key Lime and Deep Gin in at least one of the skeins. Maybe not together, but I simply cannot resist that lime green or that gorgeous deep teal blue! I know I definitely want the 4-colour stripe option and will probably give in to having one of my skeins be a 6-striper. Eek!! How am I going to make these decisions?? Got any suggestions or favourite colour combos? I'd love to hear them!! All month I've been wanting to do nothing but knit.ALL.the.socks!! Maybe it's the spurts of unusual and insanely cold weather us Islanders have been experiencing this winter, or maybe it's the fact that my feet have been nothing but blocks of ice since November. Maybe it's all those Instagram photos of other knitter's sock drawers filled to the brim with lovely hand knit socks, but whatever the reason my need to have more hand knit socks than commercial store bought socks (which is a lot) is pretty darn high. Lucky for me I have a nice selection of self-striping yarns in the stash (and of course the aforementioned CYO Self-Striping skeins coming my way in the next few months) that I'm just dying to knit up, and who doesn't like having an easy peasy lemon squeezy plain vanilla sock on the needles for those times when you need a ridiculously mindless knit on the go? And now that I'm more aware of them, there are also plenty of gorgeous sock patterns out there that are quickly filling up my queue. Sometimes you just need a challenge and need to give your brain a little workout with something more than just plain stockinette in the round. Variety is the spice of life, right? I have quite the love-hate relationship with corn. Generally, I'm not a fan of the stuff - although I can never turn down an ear of fresh peaches & cream corn on the cob in the summer time. It annoys me to no end that corn and corn byproducts can be found in practically everything. But that's not what we're here to discuss. We're here to talk about popcorn. We're huge movie watchers here in the Miso household (probably because we don't have cable) and so when we settle down to watch a flick it's only natural to want to have a bowl of popcorn to munch on. Also, from time to time the Munchkin goes on a bender in which he wants nothing but popcorn for a snack. All this I can deal with. What I can't deal with: microwaved popcorn. I just can't get over the amount of chemicals that are in a bag of the stuff. Yeah, I've eaten a fair amount of microwaved popcorn growing up. Who hasn't? But now that I'm older (and hopefully wiser) I'm not so keen on my little one eating it. Yet I don't want to deny my kiddo popcorn completely. So for Christmas I asked for an old school popcorn maker. Not sure if I had any takers (everyone guffawed and then asked me what I had really wanted for Christmas. Naturally I said yarn but no one wanted to suffer the fate of getting me "the wrong yarn"), I was content on getting myself a cheapo $20 maker that I always see in the flyers. So imagine my surprise when on Christmas day I opened up a beautiful, shiny red Cuisinart Hot Air popcorn maker gifted to me by my brother-in-law! Since Christmas day I've made popcorn galore!! From plain to drizzled with real melted butter to seasoned with spices, we've eaten batches and batches of popcorn all January long! 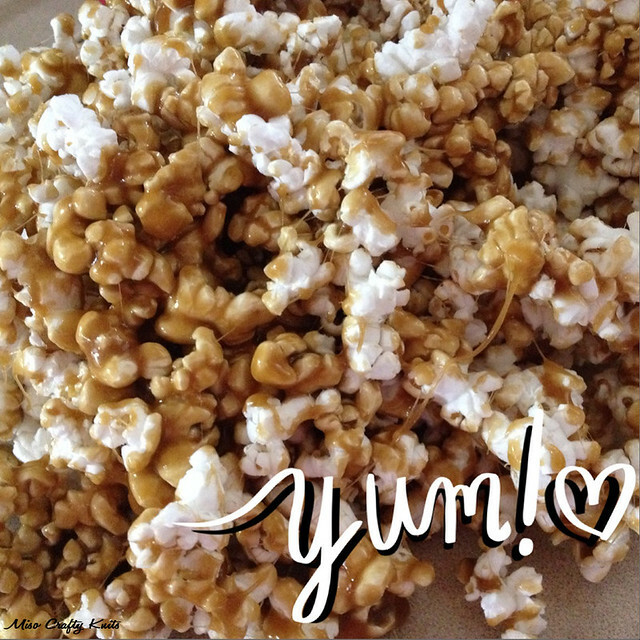 The favourites so far: caramel marshmallow popcorn, straight up popcorn sprinkled with nutritional yeast (this one is my favourite to give to the kiddo! ), and sea salt chocolate drizzled popcorn. Mmmm...I think I just might make a batch of one of these later today! So. That's January. 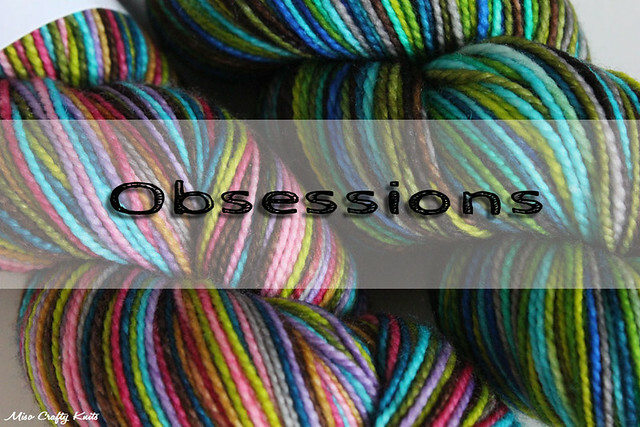 We're already a week into February but so far nothing has been sticking out in my mind, so it'll be interesting to see what this month's obsessions will be. What was on your brain all January long? Your obsessions tend to inspire me and my wallet doesn't thank you... But I do! I am an avowed chocoholic/tea lover, and I've never even thought to combine the two. And I must get back on the sock knitting train because I've only done two in the last year and I used to crank out 6 pairs a year. Thank you for sharing! Hahaha, sorry Chantel! :P Did you see that David's Tea now has tea flavoured chocolate?? I definitely need to try those out! And yes, you should get back on that sock knitting train! I don't think I've ever cranked out 6 in a year, but then again previous years I've concentrated more on cardigans (which I need to get back on!!). Hopefully this year will be the year I will churn out that many pairs and more!! I had a roommate in college who was vegan and introduced me to the joys of nutritional yeast. It was definitely the best on popcorn!